Welp, finally got my first crashes during gameplay. Always a pleasure when this happens during a good Inconceivable run. just going to make a reminder that there are two new issues with Gear4/Win10. these have been reported by multiple people here and on reddit for at least 2 weeks so far. XB1 controller vibration / force feed back bug. controller will vibrate out of control when it receives a normal signal to vibrate like a Gnasher shot or active reload. Ok, bye bye Scion Ruby. I cant fix the freeze in my challenge, it get stop at 27/6000 kill count. Neither can fix the problem whit the Settings of windows, mine is Windows 8 so, dont work out. Well, i thing this is all, thanks. Wait, what? I thought the game was Windows 10 only because of DirectX 12. Well thanks but none of these solutions work even after re-downloading the game and resetting windows and xbox app. I do not play Gears 4 via Windows/pc. My problem is whit the Scion Ruby counter, it get stock around 27/6000 and the only way to fix it is whit some options that windows 8 dont have. Try setting up another windows account login to Microsoft store under your old account you purchased the game from. My problem is whit the Xbox One. 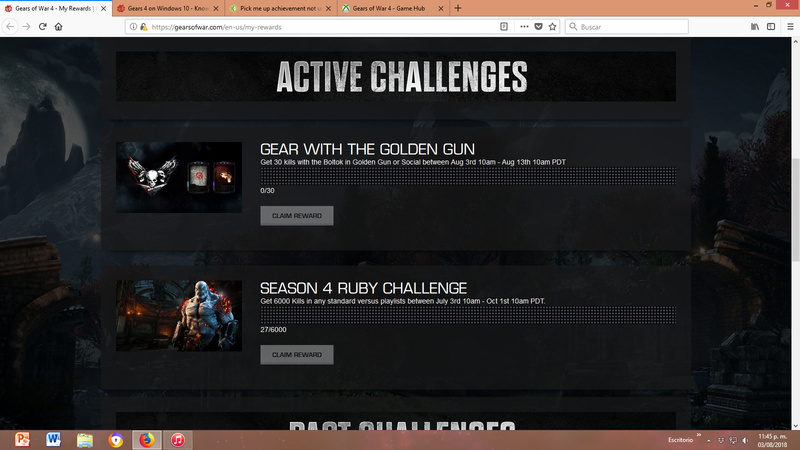 I dont play any game on PC, but the rewars page for me says that i dont have made any progress whit my challenges, is not correctly tracking my progress. Today y try to get the 30 kills for the Boltok skins and when i saw my progress, again, the page says i dont have made any kills whit the Boltok. on Thursday’ s Developer Stream Octus mentioned a fix to the Alt-Tab issue being Gears4 not being allowed to “run in the background”. a setting that can be found under Background Apps, well this is not the issue because Gears4 has never been set to not run in the back ground. a reddit user might be on to something here. basically the connection loss seems to be tied to the XboxApp. Read the description of the video for more information about this. After the latest Driver Release feedback, the team are continuing to work on this with various partners to look into further resolutions. The community team are checking in regularly with the engineering team to track progress (who liaise with our partners), and there’s some promising signs once more coming through. As soon as we have concrete news to share, we’ll be sure to post again. As a note, we saw the last Driver update DID fix the issue completely for some, reduced crashes for a greater number but didn’t fix the issue for most. We’re still on it. Thanks for your continued patience with this issue. It’s a very complex one - one that we hate still exists - and the team remains dedicated to further improvements. Game now work correctly!! !3 days -all ok!!! can solve the problem with IBIRI? still gives bans to the right and left. tired already. then at boot up, it’s just during the game. Count me in the “crash at launch” team, on all my Windows 10 games (Gears of War 4 and Halo Wars, maybe Forza Horizon 4 if the download doesn’t restart AGAIN). None of the workarounds posted here works. I don’t think it’s The Coalition’s (or Turn 10, Rare, Playground, Creative Assembly, 343 Industries…) fault: Windows 10 is just garbage. All games ran fine yesterday. Why haven’t I got my sandeigo lancer an nasher skins!!!??? I got a reward for playing stay frosty and when i went to go claim my reward it didn’t show where’s my reward !! !